Thai beauty brand Natriv presents BB Aloe Snail Powder SPF 30. This is a very fine and light face powder designed to keep your skin looking fresh and glowing throughout the day. It easily absorbs excess sebum from the surface of the skin, prevents oily shine, and protects the skin from the harmful effects of UV rays. The powder consists of almost microscopic particles that cover the skin evenly and highlight its natural beauty. It has a light beige colour and easily adapts to any complexion, which makes it suitable for most skin colours. The product covers dark circles and other imperfections, prevents greasy complexion, restores and maintains the skin’s healthy glow. The product contains sun protection ingredients and has SPF 30. Although it can’t replace sunscreen, it will provide additional UVA and UVB protection during the whole year. In addition to talc and other minerals responsible for its absorbent and matte effect, BB Aloe Snail Powder by Natriv is infused with herbal extracts such as aloe vera leaf juice, mulberry root extract, kinnikinnick (bearberry) extract, and licorice root extract. These natural ingredients have a pronounced antiseptic, anti-inflammatory, bactericidal, and healing effect. They soothe the skin and help to prevent breakouts. Another active ingredient that can be found in the product is snail secretion filtrate. It is widely used in Asian cosmetics to take care of all skin types. Snail secretion filtrate stimulates skin cell renewal, improves skin elasticity, helps to prevent pigmentation and acne scars, prevents premature skin ageing, and has a rejuvenating and revitalising effect. This ingredient is valued for its hypoallergenic properties. It is considered to be safe even for sensitive skin. Directions. Turn the cap clockwise and apply a little powder to the back of your hand. Using a brush or your fingertips, apply the powder on the face and neck, spread carefully. Remove excess powder with a dry brush or cotton pad. Ingredients. Talc, Titanium Dioxide, Ethylhexyl Methoxycinnamate, Alumina, Simethicone, Aluminum Hydroxide, Hydrated Silica, Methicone, Fragrance, CI 77492, Mica, Silica, Triclosan, CI 77491, CI 77499, PEG-4, Lactic Acid, Kojic Acid, Butylene Glycol, Morus Bombycis Root Extract, Arctostaphylos Uva Ursi Leaf Extract, Glycyrrhiza Glabra (Licorice) Root Extract, Aloe Barbadensis Leaf Juice, Snail Secretion Filtrate, Water, Phenoxyethanol. 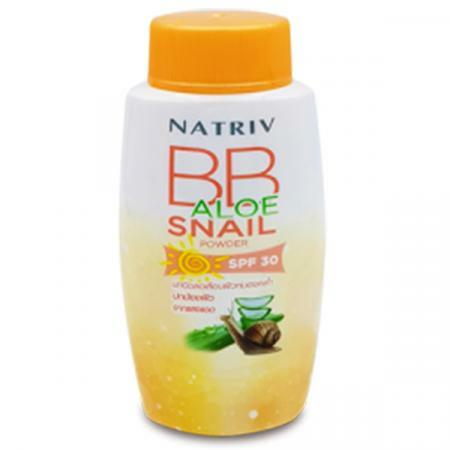 Want to buy Natriv BB Aloe Snail Powder SPF 30? Call us or submit your order via our web site!